There are always options to explore new elements to the present setting that add a unique touch to the ambiance. One of the most prominent interior ensembles that engages a lively ambiance and also ensures instant transformation to the living room space is placement of decorative cushion covers. The cushion covers which are readily available at Swayam at an affordable 25 % discount make your purchase a guilt free possession. Its affordable pricing combined with use of quality fabric ensure the customer of its long life. The quality of the covers is ensured with a boost of strength in high thread cotton yarn. The fine interlock of the smooth textures of the fabrics would foster a finesse look to the cushions that is pleasing to eyes and instantly capture the attention of the onlooker meanwhile it renders a soothing feel and touch to the skin tissues on contact. The comfort is all one can actually experience once they land self on its lumber contour. The ease and feel of relax, breathing and sleeping is best enjoyed in its embrace as cotton also ensures clean, neat and hygienic surroundings to the ambiance. It’s anti-allergenic and water proof features guard the visitor from the effects of environmental challenges. After satisfying the customers of its comfort features, the design takes the center stage. As each set is available in set of two, they can be placed in creative ways to present sofa in a different manner. The visual would draw a unique look from each angle it is looked at. The use of contrast patterns also contributes towards creating a conceptual look to the sitting arrangement. Though, the use of identical colour schemes creates uniform look and add lively ambiance to the space. 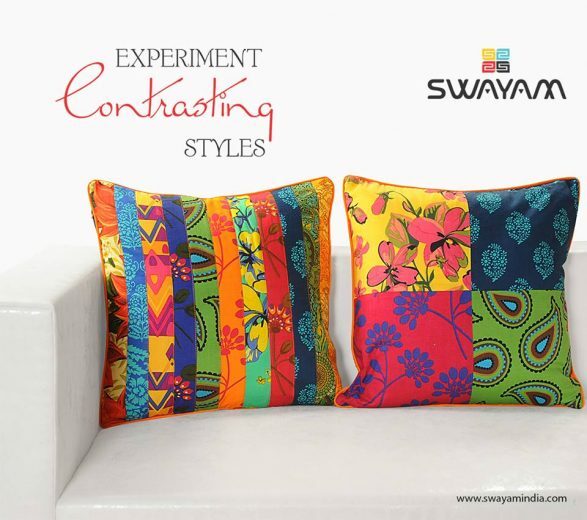 To present your bedroom with this conceptual look, you may get modern cushion covers from Swayam’s online portal.